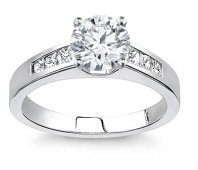 Traditional engagement ring designs seem to be boring and cliché for many couples, and hence they prefer more unique flower engagement rings. The variety of this figural design and its tremendous versatility makes it ideal for many preferences, with the additional benefit of being less expensive. It is the beauty, uniqueness and unusual designs of floral rings that attract many couples. Filigree Engagement Rings: The delicate scrollwork of filigree rings can be fashioned as an intricate flowering vine highlighting one or more gemstone blooms. 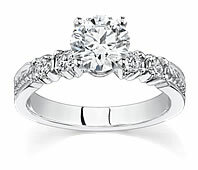 Art Deco Engagement Rings: The stylized nature of flower rings and the interconnected use of metal and colored gemstones are perfect for art deco styles. Celtic Engagement Rings: The symmetrical knot patterns of Celtic rings can be woven to mimic vines, leaves, and flowers. 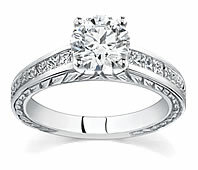 Engraved Engagement Rings: Small blooms can be engraved on the exterior of a wide band for a subtle floral accent. Regardless of the design, the types of flowers, setting, metals, and gemstones can all be adjusted to create a distinctive personalized ring.